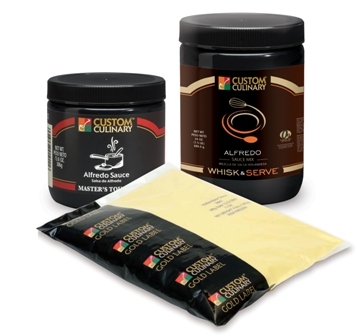 From classic sauces to today’s exciting global and regional blends, the finest quality and most authentic Culinary Flavor Systems come from Custom Culinary, Inc. From traditional classics, such as Alfredo and Hollandaise sauce, to on-trend ethnic accents, such as Sun-Dried Tomato Pesto Sauce, we bring authenticity and simplicity together for you. We offer three levels of sauces to meet every operators needs. Offer a made-from-scratch taste in an instant. A full range of mother sauces and ethnic accents in a convenient, frozen format. Ethnic flavors cover Southeast Asia, the Caribbean and Latin America. All sauces are made with the highest-quality ingredients, including real dairy, authentic wine reductions and fresh peppers. Just thaw, heat and go. Offer cooked-from-scratch flavor in an add-water-only concentrate format. Created to hold on a steam table for up to 8 hours while providing consistent flavor and texture. Our line of Master's Touch® Sauce Concentrates, including an Alfredo, Hollandaise, and Demi-Glace Concentrate, provide a well-balanced flavor and texture profile to enhance traditional classics. Offers best-in-class flavor and simple water-add only preparation. No need to add additional ingredients such as milk or butter. Can be frozen and reheated without separation or spoilage. Flavors include demi-glace, Alfredo, hollandaise, beurre blanc and a white sauce. Just whisk and serve.